I spoke at Montreal Meets on April 9th and one of the big hooks in my presentation was revealing this poster onstage for the first time. Until now, it had only existed in cellphone photos on Twitter. But here we go, a poster for one of my favorite films: BLADE RUNNER. This poster truly represents the new direction I’m forcing into my work. I’ve had a keen interest in designing movie posters for quite some time, and this was nothing less than a huge undertaking. From reference photos, digital studies to the final build it took about 2 weeks full time to get it done. Another big departure was building this thing entirely in Illustrator. There is zero Photoshop work in this piece, something I’m pretty proud of. If you saw my Influxis Voodoo Lounge presentation at FITC Toronto 2012 you would have seen an indepth process of how I planned and built this poster. Really long process, so long it ultimately changed how I work. This poster needed to be treated with respect. I love the film and it has a huge following all over the world. It ultimately defined a new genre of science fiction in both story and atmosphere, and I needed to keep that intact as I worked through the design. High scrutiny was placed on every element in this poster to ensure I got it right. Pursuit of a proper representation of BLADE RUNNER. WTF?!?!?!?! This poster is SICK! Beautiful work! Definitely a favorite movie of mine too…and this could be my new favorite poster…any chance I can purchase one for my collection??? Keep up the awesome work you do! Love this! I’m interested to know how you handled the background noise effect using vector shapes only. Wicked! You have really captured the film essence here. I would really have loved to see some of the future high-tech get in there a little more though but it’s awesome as it stands. In fact I will probably end up watching the film tonight as it’s been a while since I last saw it and if a poster design gets you doing that then its on the right track. Great job James. Yes!! Love this! Definitely want to be on the list if you ever offer these for sale! 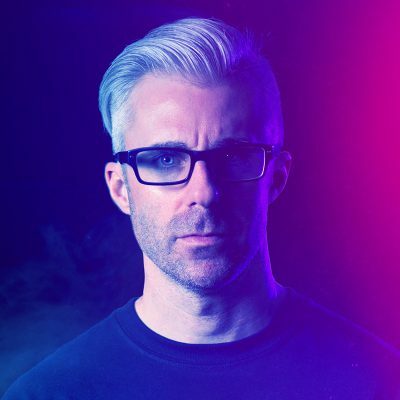 I agree with DarkoDesign, a bit more sci-fi elements would make it even better! Because if you have never seen the film before, it would difficult to tell from the poster alone that it’s science fiction. Sci-fi elements felt too easy. I wanted the poster to be film noire. Atmosphere vs. physical elements. Great work again James, loving the illustration. The only thing that doesn’t quite work for me is the Harrison Ford text, but overall it really captures the film. All my monies. You may have them. A great take on the film using your style James! I like the rainy wet feel as this is evident throughout the film and also that red really pops! Gritty, dirty film noiresque. You certainly captured it! Loved it at MMTWO and love it now that it’s out in the wild. I’m so happy for you, man. It’s cool to see you stepping into your dream—it inspires me to keep pushing for mine. By the way…I just notices that your footer says Signalnoise Design Studio Inc. So you incorporated. Nice. Congrats on that as well! Dude!! This is amazing!! Whilst I haven’t seen the film (soon to be rectified after seeing this poster) I have read up a lot about it and from what I can see this poster, these colours, this composition definitely does it justice. I can definitely see a shout out to the great Drew Struzan here but still maintaining your visual style!! Very nice composed James.. Look forward to seeing more.. I look forward to a more….. family orientated poster.. such as Jurassic Park or something??? Haha.. Keep it up mate.. Looks spectacular! Well James, like yourself this is one of my favourite films of all times. It still amazes me to this day how far ahead of it’s time it really was. I feel you have captured the essence of the film in your choice of colours and with the touch of rain. And I love the subtleties like the hint of red in both Rutger’s and Sean’s eyes. Great piece of work. Something that I will hang proud on my wall, when and if made available for sale. I never liked the movie, but I always enjoyed the aesthetics of it. I really like the composition and the colour scheme is excellent. Quite a challenge to set yourself, James. The poster reflects the mood of the movie very well and you’ve definitely pushed yourself on the vector front with the developing style over the last few projects. Capturing light and shade in such definitive lines is always a leap of faith, and you almost have it here. My eye is drawn to Harrison Ford’s bottom lip. 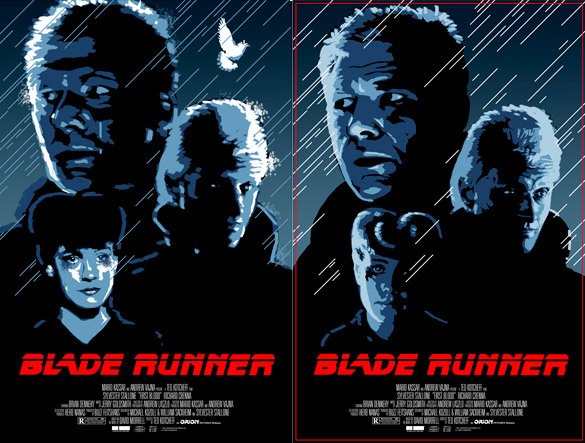 The black and the shape you’ve used in the final poster leaves the mouth as a whole as a rather ambiguous shape, one which appears clearer during the poster’s development. Perhaps a little more clarity in the shape or a change in the use of colour around the mouth would remove the ambiguity and make the poster greater than the great it already is! I think this poster is perfect. 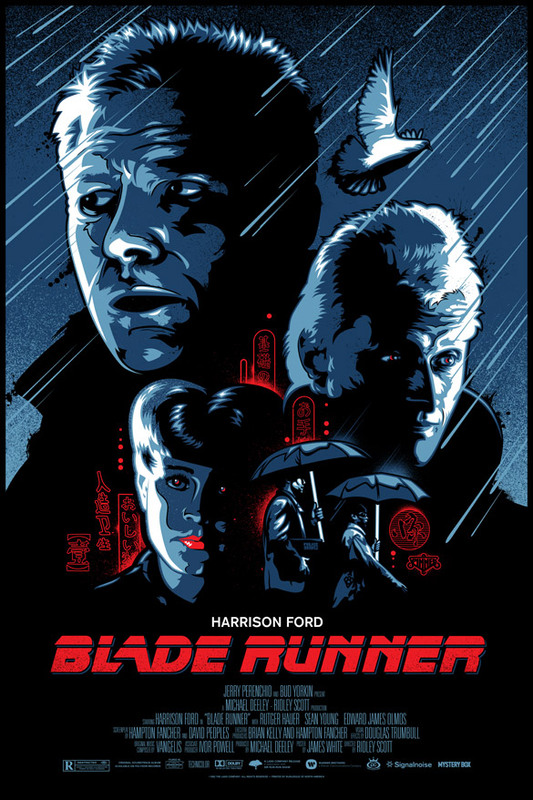 It very well captures the feeling of the Blade Runner movie, which is one of my all time favorites. Are you gonna put it up in the shop for sale? James, you have to get these on sale somehow. I need this poster. Hello, My blade runner poster collection is massive. Would love to add this. Is this a silk screen?